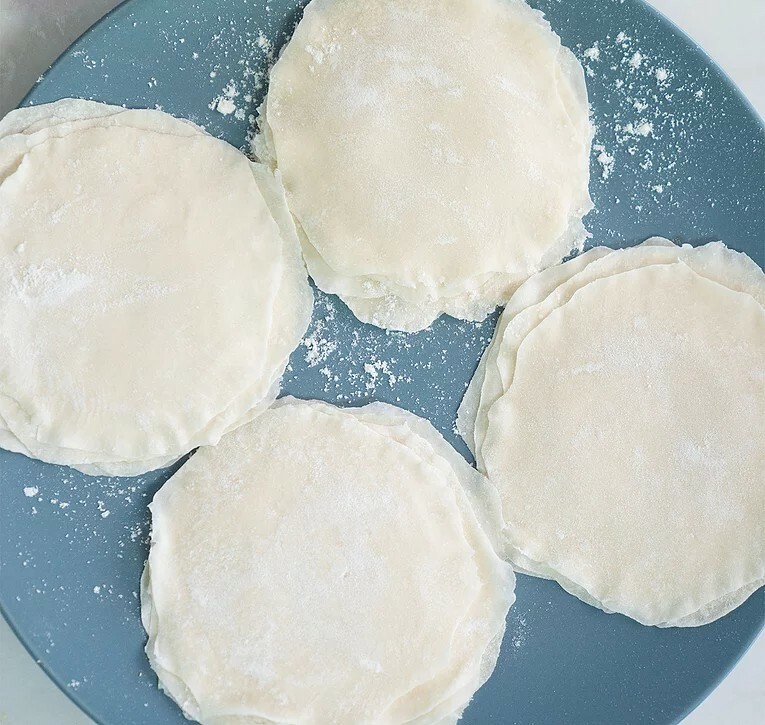 To making the dumpling wrappers, place the flour in a large bowl and make a well in the centre. Pour in the warm water, stirring with a wooden spoon. Once the mixture starts to come together use your hands to knead until the dough forms a clean ball. 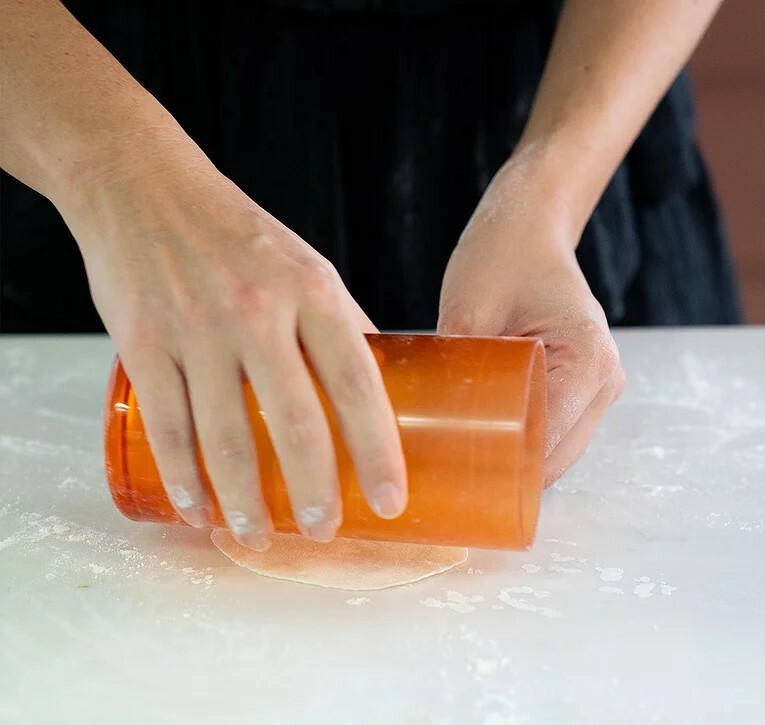 Transfer the dough to a floured work surface and knead for 3-4 minutes or until the dough is firm and bounces back when you poke it with your finger. Place the dough in a sealable bag and seal. Let the dough rest and steam in the bag for 15 minutes. Stretch dough into a bagel-type shape. Then cut in half to form 2 equal-sized logs. Take one log and roll it to about 2cm in diameter. Cut into even pieces (each log should make about 10 pieces that are about 10g per piece). Roll each piece into a ball. Take one ball and use a plastic cup or small rolling pin to roll the ball into a flat circle. Then roll the edges of the circle thinner than the centre. You should finish up with a wrapper about the size of your palm. 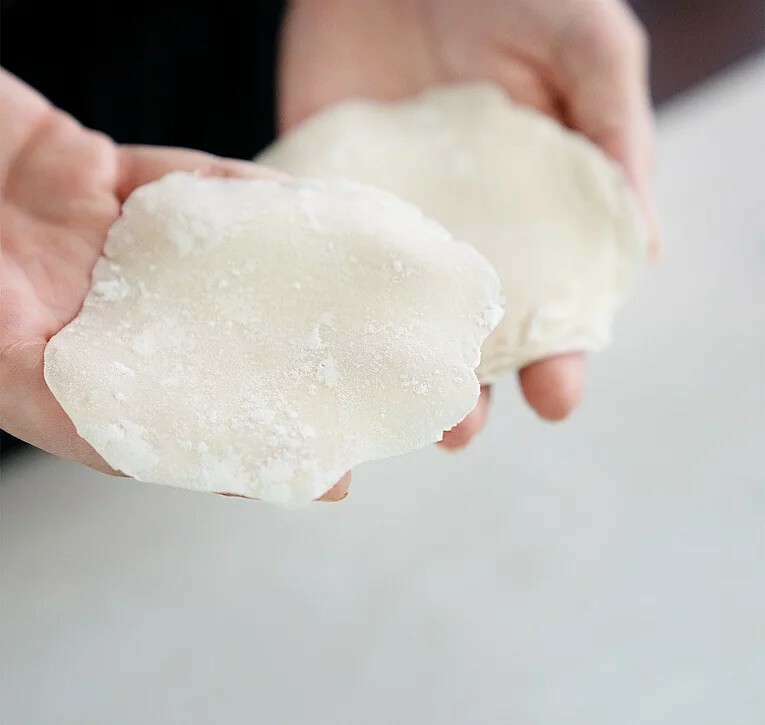 Place wrapper onto a floured surface and continue the same process with the remaining dough. Be sure to generously flour between the stacked wrappers and don’t pile too many on top of each other because the weight can cause them to stick together. Use straight away. Or keep frozen in sealable bags. When using from frozen – thaw for about an hour outside of the freezer. Carefully separate the wrappers and sprinkle each with extra flour.